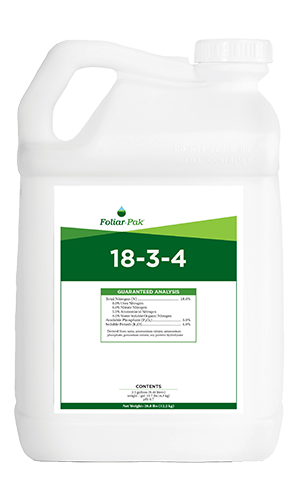 Foliar-Pak® Boron is a highly concentrated liquid boron product formulated by reacting boric acid with a specific amino acid to deliver a new boron-amino acid complex. This complex increases the boron solubility, helping it move into the plant more effectively. The amino acid itself metabolizes into important structures that improve plant performance. 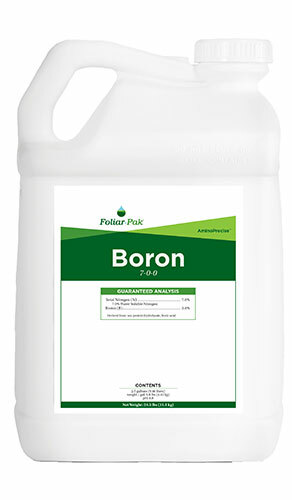 Foliar-Pak Boron provides health responses not offered from other Boron fertilizers. Foliar-Pak Boron is a prescriptive fertilizer used as a supplement when soil or tissue levels are found deficient. Foliar-Pak Boron will improve energy transformation reactions and carbohydrate transport mechanisms. Boron deficiencies result in lower Potassium uptake, lower rates of water absorption and lower transpiration. Root cell elongation is dependent upon good Boron levels. Calcium and Boron work in tandem to form pectates that strengthen cell walls. Boron is required for lignin formation but when boron is limited the process is derailed resulting in harmful free radical production instead. 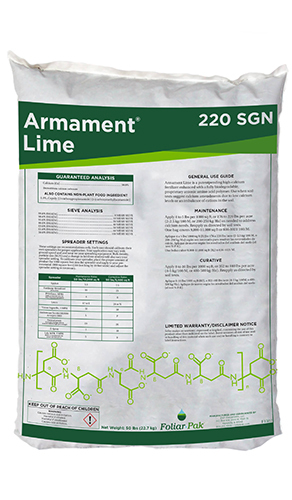 The amino acid component in Foliar-Pak Boron metabolizes into structures that increase chlorophyll production and build anti-stress compounds.